Living in the Bay Area, it’s hard to go anywhere without finding something with the name John Muir. John Muir, famous environmentalist who started the Sierra Club, and whose essays and books about the majestic wilderness are still popular reading, spent the last half of his life on the West Coast. He worked to preserve the Western Forests and National Parks. 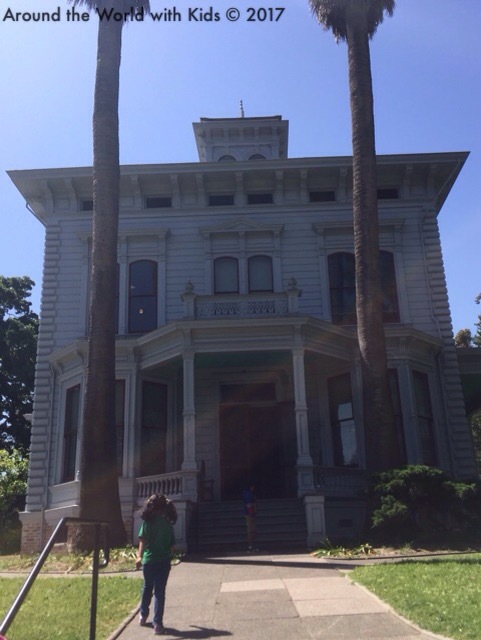 His last home was in Martinez, CA, in a lovely house on a hill, overlooking the water and the fruit orchards that the Muir family used to finance his adventures. 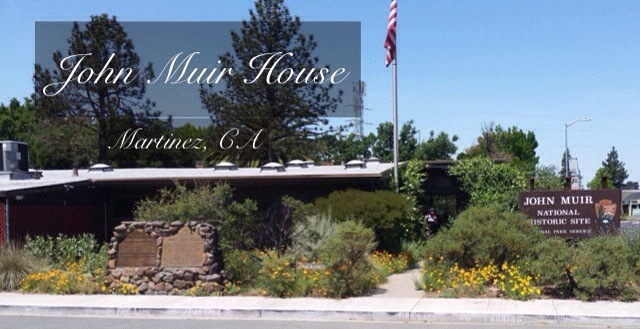 John Muir’s home became a part of the National Park Service in 1964, after the house was abandoned and put up for auction. 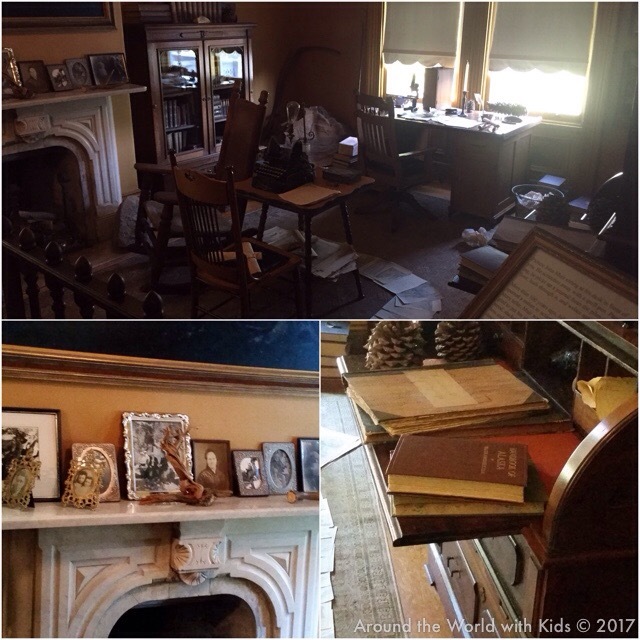 After entering the visitors center, you can walk up the hill and wander around the 2 story house and experience a bit of Muir’s life in late 19th century. We went on a weekend morning, and were lucky enough to catch the ranger as he was giving a tour of the 1st floor. 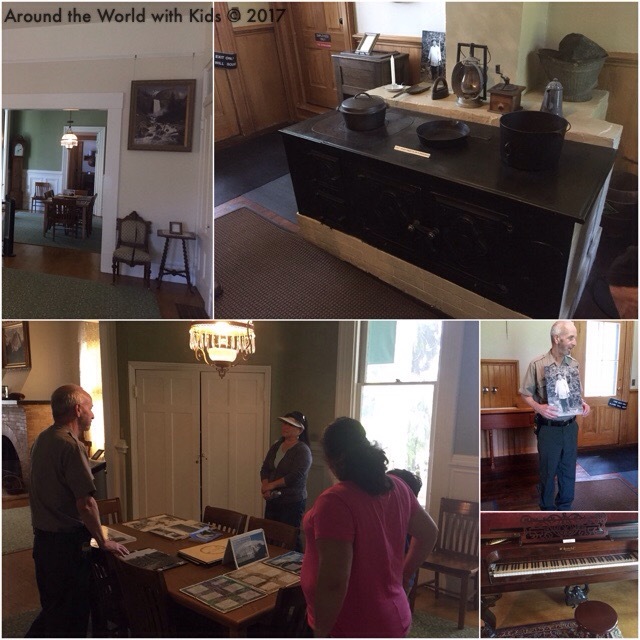 The park ranger spent about 40 minutes going over the details of John Muir’s life in the area: how he met his wife Louie at 42 years old, how he came to live in the house we were standing, and the fun stories John Muir used to tell. 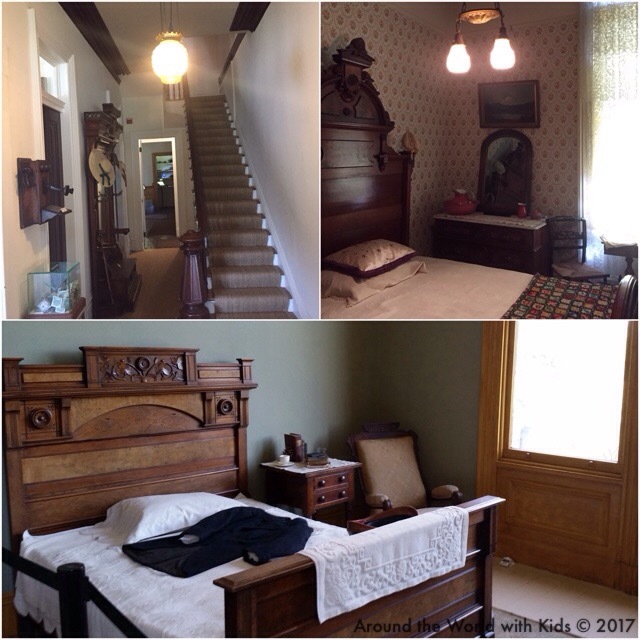 Much of the furniture in the house belongs to that period, and a lot has been donated from John Muir’s descendants through the years. 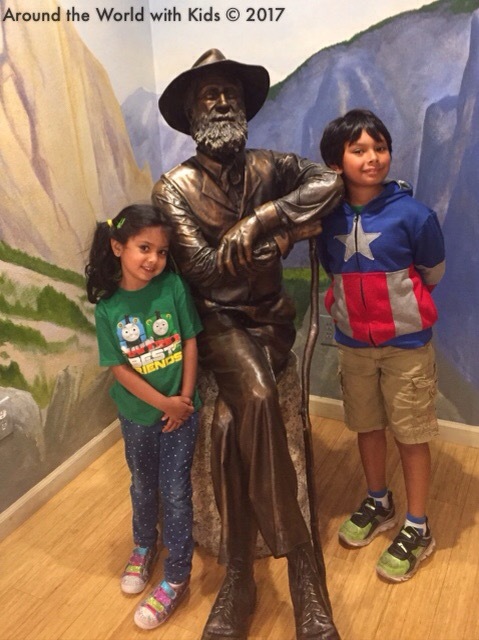 The last room of the guided tour was full of pictures to look through, and books for kids of all ages to learn about John Muir and environmentalism. While the ranger told us stories about John Muir’s escapades on a glacier in Alaska, camping with Teddy Roosevelt, and about the sad end to his life, my children immersed themselves into books such as “The Lorax”, “Michael Recycle” and “Camping with the President”. 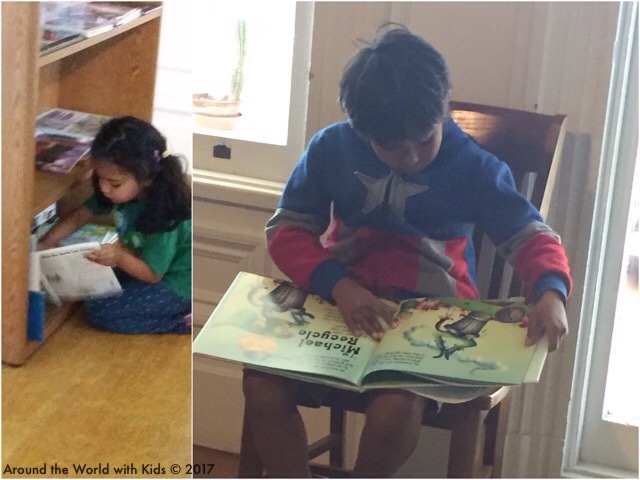 The kids found the books a fun distraction during the “boring” history lesson. Jokes on them, they instead read lessons on environmentalism. After the tour was a real treat. We were given permission to wander the 2nd floor and attic on our own. The second floor has the bedrooms of John, his wife, and his children. The children’s room was filled with pictures of trains, which was an obsession of the youngest daughter Helen. 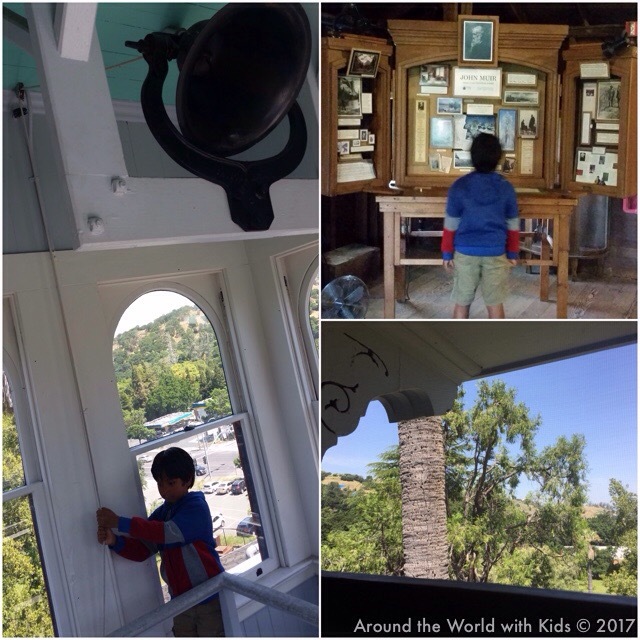 My train loving son found kinship in that room. Up one more flight was the attic, where you had beautiful views out to the hills and water, as well as an exhibit on the Sierra Club, and lots of old items tagged and ready for display one day. We spotted an old fashioned bed, a baby carriage, and a steamer trunk! From the attic you could access the bell tower. Up some very steep steps you come to a bell tower that had high Windows and the best views of all. Plus there was…you guessed it… A bell! And you can’t go in a bell tower and NOT ring the bell, right? It just felt wrong to skip out on an opportunity like that. The coolest part of the house was actually on the 2nd floor. Recreated in precise detail was John Muir’s “Scribble Room”. Muir did not take to writing naturally. He had lots of journals and sketches, and legend was he was an excellent story teller. But, apparently he hated to write them down. His wife was the one who encouraged him to write his essays and books, and was his editor. He would close himself in his scribble room so he would have no distractions. This was where all his masterpieces were created. The only pictures of the house that survived were of his scribble room, so it’s in precise detail. You see all his works laid out, his desk as he liked it, and the pictures he surrounded himself with. You could imagine him sitting at his desk, recalling a story, and working hard to capture that image in his mind in words and sketches. After the house, we walked the grounds a bit. 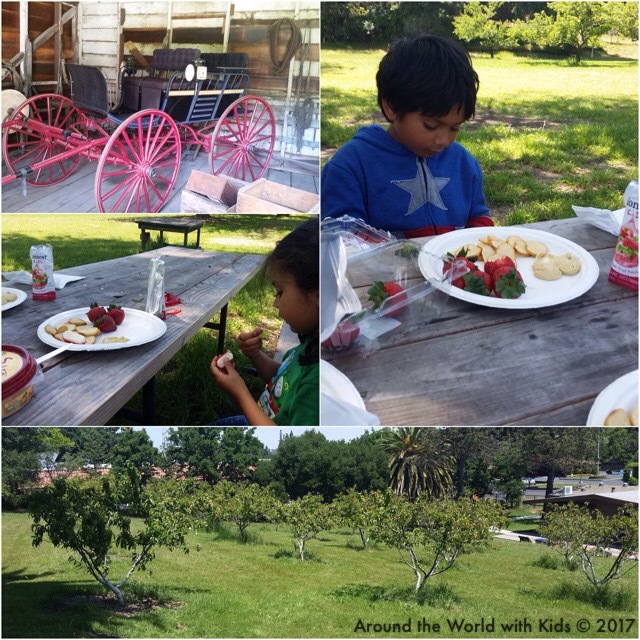 We found the carriage house, the windmill that was used to bring running water to the house, and had the kids try and guess all the fruit growing in what is left of the vast fruit orchards that was once there. Then we found some picnic tables by a creek, surrounded by shade of the tall trees, and ate our picnic lunch we packed. It was the perfect way to wrap up our morning of history and wanderlust.